Forget error-prone Excel calculators and build apps instead. 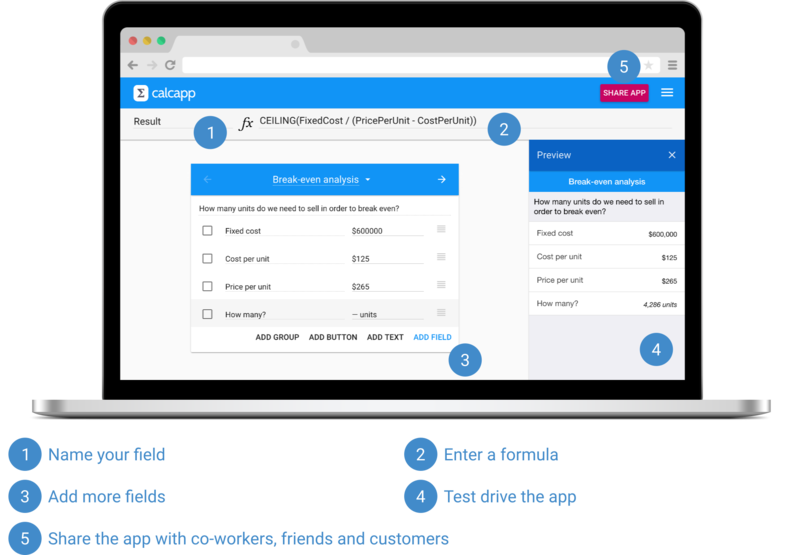 Imagine a cloud-based app designer enabling you to create apps without having to do any programming. Apps can be used anywhere you have access to a phone or a tablet—perfect for the field. Forms are much easier to use than a spreadsheet grid. Use formulas to calculate everything from field values to the recipients of a report. Select from hundreds of Excel-compatible functions. Apps run in a web browser or can be installed to your users' home screens, complete with your logo. Once installed, apps work offline. 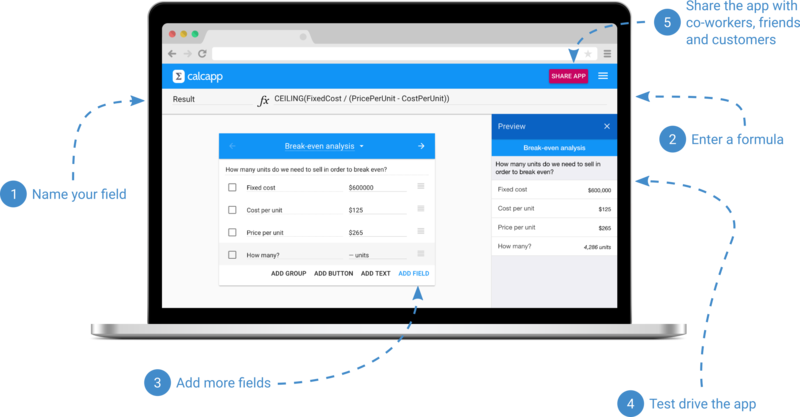 Create apps consisting of any number of screens with fields, drop-downs, buttons, switches and sliders. Calcapp supports 79 different languages. Send collected data as a PDF report or use it to add rows to a Google Sheets spreadsheet or send messages to a Slack channel and more. Select between public apps accessible to the world, private apps requiring users to sign in or apps embedded in your web site. Take Excel, replace the grid with an app designer and you have Calcapp. The formula bar works as you expect it to and all your data is stored in the cloud. When you are ready, share your app with co-workers, customers and friends. Create and preview apps without having to create an account and sign up when you're ready to share your app. You can also get in touch with our sales team to learn what we can do for your business.